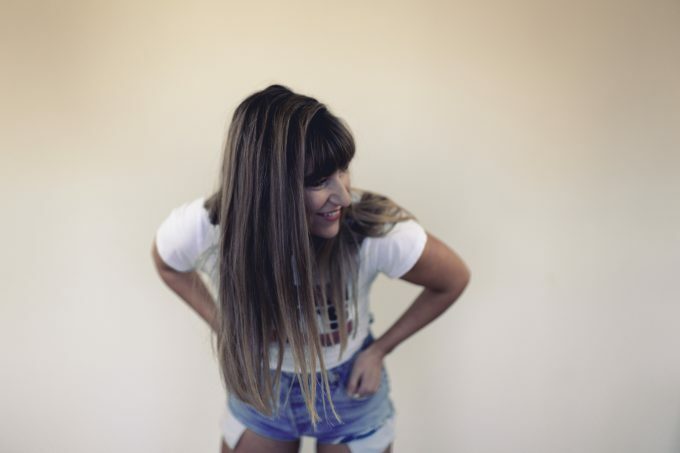 To celebrate the release of her new single ‘Beat You Down’, we get to know Tamma, a Melbourne-based performer with the world at her feet. The new track is pure pop; with a message overflowing with optimism and positivity… it also comes with a music video that’s truly world class. Incredibly strong local pop music… we couldn’t not give TAMMA a feature! 01. Name : TAMMA AKA Tammy Martin. 03. How did you get your start in music? I have musical family both Mum and Dad’s sides. I grew up surrounded by musicians, it was impossible not to get swept away in the magic of it all. My Nanna (Dad’s mum) singing like an angel while she baked bread and my Manny and Grandpa (Mum’s parents) owned music shops all over the place. The house was full of instruments and soulful singing. We have family get together with up to 45 family members all singing Maori waiatas or old school songs from our parents’ youth. I got my first guitar at 10 but decided to pursue theatre instead, so the songwriting came much later in life after my vocal surgery. I knew theatre wasn’t for me after I ran away from an audition never to go to another one again! I got given a keyboard and spent a year learning off YouTube ‘coz I wanted to be a songwriter badly! In 2015 I got an original song on the TV show ‘Neighbours’, that was pretty insane because I was still trying to work out if my songs were any good. This was a huge boost for me and I kept going. I love writing music so much, it’s damn hard though! Persistence, resilience and practice are key. 04. Give us five words to best describe you as an artist. Raw, fearless, playful, passionate, authentic. 05. Tell us a little bit about your sound and how it developed. I feel like I am forever evolving and experimenting with my sound, but I am drawn to warm upbeat summer vibes and my inspirations such as Amy Winehouse, Nina Simone and Sia ooze that soul that I love so much. I usually write according to the emotions I am experiencing at the time, which influence the way each song evolves. 06. What’s your earliest musical memory? I was three years old, I sang in front of my first audience at church of about 100 people. I was standing on a box to reach the microphone with Mum and my two big sisters singing with me. The song was about a lighthouse being there for you in the darkness to light the way. 07. Who have been your musical influences? Ah there are so many! I remember listening to records with Dad and vibing hard off Stevie Nicks, Dire Straits, Bonnie Raitt, Chuck Berry, The Beatles, Cat Stevens, (Dad got me my first ever CD at 10 and it was Cat Stevens) right through to Amy Winehouse, Nina Simone, Mø, Diplo, Brody Dalle, Beyonce, Sia, SZA, Childish Gambino. 08. What are your favourite songs of all time? Ohhh that’s a hard one I have so many, lots of current ones but the ones that are timeless for me are Dire Straits’ ‘So Far Away From Me’, ‘The Chain’ by Fleetwood Mac and ‘Feelin Good’ by Nina Simone. They’re songs I’ll always love. And I don’t even care how cheesy it is but ‘Don’t Stop Believin’ by Journey is def up there haha. 09. Where’s your favourite place to listen to music? Blasting it in the hot sun on a coastal road with the windows down and knowing you don’t have to be anywhere in particular. 10. Who are your go-to artists when you’re feeling : Happy? Sad? Introspective? Exhausted? Hmmm I consume music like a sponge to water so I always find new stuff each day to suit the mood I’m in, but I’d say regulars for all moods are Khruangbin, The War on Drugs (‘Lost In The Dream’ album), The Teskey Brothers, Childish Gambino. 11. What was the first album you ever bought? I saved up all my pocket money to buy Red Hot Chili Peppers’ ‘One Hot Minute’. 12. Give us a little fun fact about yourself that people might not know. I owned a 1965 Studebaker Cruiser with a 283 Chevy engine in it when I lived back in New Zealand and Dad taught me how to pull the engine to bits and rebuild it. 13. What would your chosen career be if music wasn’t an option? My Grandma was a tour guide and travelled the world my whole life and I reckon she had a pretty sick job. 14. What’s the best advice you’ve been given in your career? Don’t stop doing what you love and treat people kind. 15. If you could trade places with any artist in the world right now, who would it be? Beyonce. 16. Tell us about your latest release. ‘Beat You Down’ was written in a cottage in the bush. I love that music is a healer for me and I can just pack up and go anywhere to write. I write through all the ups and downs life throws at me. Having vocal surgery twice and losing my voice and identity seemed trivial and was trumped after the tragic and sudden loss of my nephew ‘Buddy’ in 2016, which threw me into an unknown and scary place. I realised how quickly life can change and turn on you. Suddenly my main priority in life was to get my sister, family and myself through the grief and confusion, why do children have to die? Try explaining this to the other little people in your family who still ask where Buddy went? I wanted to write something for them to feel uplifted, the way music does for me. Walking through the countryside, I was thinking about my little nieces, navigating through life at different ages and stages. It’s confusing enough as a young one and then trying understand that loss on top of that is hard. I thought about my own journey what it’s like as a female today. ‘Beat You Down’ is for my nieces and nephews and family if they ever feel discouraged or hurt, don’t let them beat you down, stay close to your loved ones. It’s a message for anyone who needs a pick me up, life’s bigger than letting people or trivial things get at you. 17. What do your future plans involve? To continue to write music that inspires and uplifts people, tells my stories and connects with people from all walks of life. I will release a series of singles, an EP, do live shows, tours, festivals, to continue to host vocal coaching workshops, hold a charity event and also I’ve always wanted to move to LA since I was a kid. But mainly it’s to continue to enjoy life and make my loved ones smile. 18. Where can our audience catch you live? I will be playing a stripped back acoustic gig on the October 21 at Fauroke’s Olive for Darebin Music Feast.